Length: 21 hrs. 6 min. 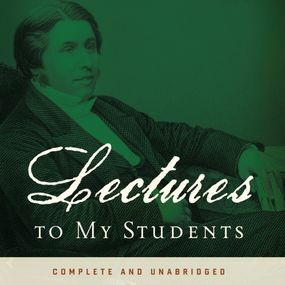 One contemporary scholar and authority on Spurgeon says of this work: "Next to Mr. Spurgeon's great literary work, The Treasury of David, we consider (these) Lectures to My Students his greatest single contribution to the Christian world. There is more practical wisdom, common sense and sage advice packed within these pages than with any other book of similar size, or content." This complete and unabridged edition of Spurgeon's great work will make it possible for today's generation to appreciate Spurgeon's combination of discerning wit and refreshingly practical advice. Included in the twenty-eight chapters of this classic volume are lectures such as: - The Call to Ministry - The Preacher's Private Prayer - On the Choice of a Text - On the Voice - The Holy Spirit in Connection with Our Ministry - The Blind Eye and the Deaf Ear - On Conversion as Our Aim - Illustrations in Preaching As were all of Spurgeon's messages to his people, each of these lectures is Scripture-saturated and Christ-honoring. They move swiftly and are fascinating in their content and sage counsel.